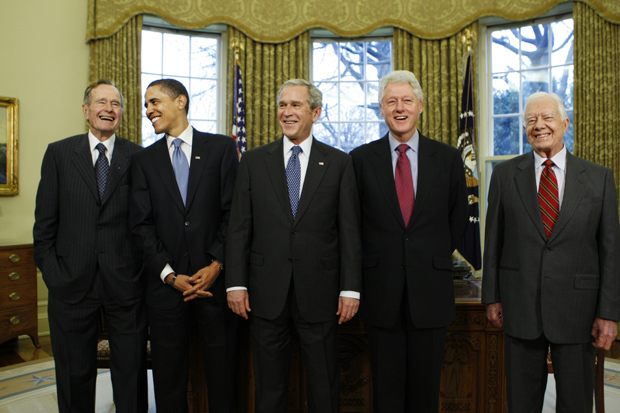 Barack Obama is welcomed into the ‘Presidents Club’ by former presidents George W. Bush, George H.W. Bush, Bill Clinton and Jimmy Carter. Why would former campaign rivals and political enemies — still jockeying to secure their place in history — join a club in order to be of real help to each other? That’s the central question raised by The Presidents Club, Nancy Gibbs and Michael Duff’s book about the impact and import of the world’s most exclusive fraternity. With the presidential campaign about to shift into high gear, I picked up a copy. It turns out the answer to my question is political and practical, but also very human and personal. The authors claim these men have endured experiences and decisions that few executives have ever dealt with. Moreover, the authors argue that, in the modern world, a President’s decisions and actions are global, not simply national in their impact and importance. Bottom line: They need each other for council and advice — even a shoulder to cry on. John F. Kennedy captured this issue succinctly after just ten days on the job. “No man entering upon their office could fail to be staggered upon learning…the harsh enormity of the trials through which we must pass in the next four years,” he said. “Each day the crises multiply. Each day their solution grows more difficult.” Former senator and presidential candidate Gary Hart once suggested that presidents wind up governing a country and dealing with problems that they never expected to handle. No one is ever prepared for the job; everyone in the job needs help. Political analyst James Fallows has argued that no president is perfect, and that every president is bound to fail in various crucial aspects of their job. That’s why presidents need to be open to the insights and experiences of others who have been there before them. Machiavelli once said that the successful prince must be a student of history to succeed as a leader. Gibbs and Duffy argue that the “Presidents Club” is a way to learn history by seeking refuge, respite and advice from others who have shared the office and understand the issues. “The Club of Presidents” is an attempt to overcome the great paradox of the presidency: It is simultaneously the most public and yet the loneliest office in the land.